When You Place Your Order Right Now, Youll Automatically Get Upgraded To Master Resell Rights So You Can Also Sell The Resell Rights To This Hot Product! You dont have to deal with customers, EVER! Heres how it works: Google Adsense lets you place ads on your website. Every time a visitor clicks on an ad, you make money! Google AdSense lets you use text-only ads! Text ads wont slow your site down and have been proven to be more effective than even animated ads! Now, Youll Hate Yourself Later! If youve ever tried profiting from Google Adsense before, you know it takes more than just setting up a website to start seeing any cash. Dont make the mistake of thinking Google will let just ANY website join their program! The truth is, Google likes some websites better than others. Ill let you in on the top secret industry conversations that will reveal how to set up your content site for maximum profit. Inside my report, youll learn my 5 step battle plan to Google Adsense profits. Youll learn how to format your ad blocks, research keywords, develop the right type of content and more! When youre done reading the insider tips, tricks, and techniques only the pros know - youll feel like youve been ready for this your whole life! Where to place your ads for maximum exposure (theres a technique to it). How to use Googles built-in features to track your results and formulate your game plan. 12 dos and donts for for your (long) journey with Google Adsense. And believe me, thats far from all. 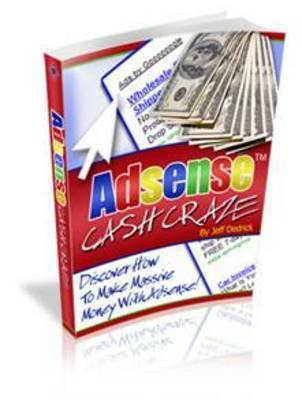 Adsense - Let Me Teach You How! After you look through my report, if its not all what you thought it would be, just write me a personal email saying so. You can make it short. Just let me know it wasnt what you were looking for. I wont ask any questions - but I will refund your money ASAP and well part as friends. Now you cant pass that offer up. Ive taken away all excuses to wait. Click the button above left, because there are a few questions for you to answer before you get my report. See you in a few!